What a difference five years makes. Back in 2008, the New York Times was hopeful that Silicon Valley’s expertise in chips, miniaturisation and entrepreneurship might help it lead the world in solar panels. As late as February 2011, one enthusiastic environmentalist website hailed the more general arrival of what it called ‘The Golden Age of Solar Electronics’. Since at least February 2013, however, Valley venture capitalists and private-equity investors, burned by a series of reversals in solar, have preferred to invest in energy storage technologies and electricity grid management. The promised convergence between American IT and global electricity generation hasn’t quite happened in the way that was hoped for. The solar market still has a lot going for it. Next year, one estimate has global demand for photovoltaic systems up at a record-beating 45-55 GW, driven primarily by China and Japan. Nevertheless, subsidies for the supply of solar power have faced big cuts in the US, the UK, Germany, Italy and Spain. As a result, American sources of funds in and around IT innovation, ever restless, have moved on. In basic solar research there are continuing breakthroughs in and around semiconductor materials. Nowadays, though, attentions have shifted to what one industry group calls ‘distributed generation, microgrids, energy storage and demand response’. The willingness to put money into energy storage is long overdue. Because wind and solar power are intermittent, there’s a great need for innovation in IT-controlled energy storage devices of all sorts. However, with ‘demand response’, the goal is more questionable. Much of the purpose of smart grids, and certainly of smart meters, is to try to lower corporate and household demand for energy. I say ‘try’, because there’s plenty of evidence that higher efficiency in the use of energy is subject to a rebound effect, (PDF) in which energy demand actually rises rather than falls. In today’s parsimonious times, then, IT can all too easily be corralled away from the essential supply of photovoltaic energy, and instead made to veer toward a regime of obsessive measuring, accounting, scrimping and saving in energy. There is, of course, a positive side to smart grids. Faced with more varied sources of energy supply, the US urgently needs to bring IT to bear on the management of its electricity grid. Since Hurricane Sandy in October 2012, there has also been an argument that the US grid needs greater resilience built into it. Yet the smartness that America seeks right now isn’t a genuine, progressive, ambitious, IT-led overhaul of its energy infrastructure. In today’s climate, smartness in energy tends to denote efforts to meter energy use, and to try to massage it downward. The quest is for lower energy use, not a better energy supply. By the end of 2012 there were more than 46 million allegedly ‘smart’ meters installed in the US. Officially, too, the UK has plans to invest a cool £12.1bn ($19.5bn) in smart meters, although Steve Thomas, professor of energy policy and director of research at the University of Greenwich, London, argues that because the meters lack time-of-day pricing, they’ll be pretty dumb. Around the world, attention has fastened on the IT-assisted but Lilliputian domain of energy ‘harvesting’ for sensors, actuators and ‘wearable electronics’. Meanwhile, International Energy Agency statistics show not only dwindling budgets for R&D in nuclear power and fossil fuels, but also budgets for R&D in energy efficiency exceeding those for R&D in renewable energy supply. Everywhere, IT’s priorities in energy are similar. In energy, IT works for data analytics, the display of numbers that encourage energy guilt, and the provision of minuscule amounts of energy to power the forthcoming Internet of Things. Nowadays IT doesn’t want to work for the plain old generation of electricity. To commit yet more resources in that direction is thought too risky. Yet in America there is an exception that tends to prove this rule. One of the bigger fans of a cuddly, green energy supply, in the shape of solar power, turns out to be… the Department of Defense. Under a mandate known as 10 USC 2911 and updated in 2009, the DoD has been required from fiscal 2025 onward to produce or procure 25% of the energy it consumes within its facilities from renewable energy sources. (PDF) As a result, the military bases of the US Army, Air Force and especially the Navy plan to harness 1.1GW of solar energy by 2025, which is about equal to the whole world’s installed capacity in solar in the year 2000. In May, Sharon E. Burke, assistant secretary of defense for operational energy plans and programs, noted that the US armed forces comprise “a big energy consumer when you’re talking about projecting power and presence all over the world to secure our interests.” Therefore, she added, DOD officials would “take a closer look at energy supply and storage, from high-efficiency renewable energy, scavenging technologies and design integration.” And in September, the DoD contracted with the San Diego manufacturing arm of Soitec, a French company, to supply Fort Irwin, in the Mojave Desert, California, with highly efficient concentrator photovoltaic (CPV) solar power modules. These track over two axes and come complete with Fresnel lenses that concentrate sunlight on to 2,400 tiny multi-junction solar cells. 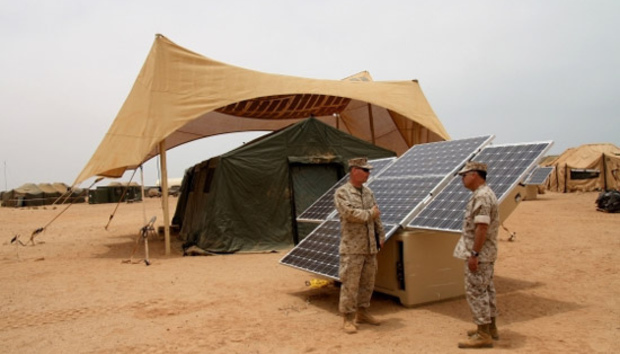 On the battlefield and on the soldier’s backpack, as much as back at the base, the US military regards solar power as an effective check on carrying too many precious and vulnerable supplies of fossil fuels. In Afghanistan, solar power is used for floodlights, and to assist Special Forces. Even without the US military, we can be sure that there will be more clever solar electronics to come. Humanity still stands at the inception of that sector, not the finish. Yet there is progress. On 11 October, a driver and team from Delft University of Technology, the Netherlands, finished journeying 3000km from Darwin, north Australia down to Adelaide in the south in a solar powered four-wheeler that, over five days, averaged more than 90kph. At the same time, criticisms of solar panel manufacture don’t just come from environmental media. They stretch through to the Scientific American, which worries about how much tin, silver and aluminium are involved in the manufacture of solar cells. In the 21st century, serious power cuts have already afflicted both developing and developed economies. Yet despite this, the trend remains for IT to hunker down and try to conserve energy, rather than sign up for making it anew. James Woudhuysen is Professor of Forecasting and Innovation at De Montfort University, Leicester, UK. A physics graduate, he helped install the UK's first computer-controlled car park in 1968.